The main body fabric of this Camo Carrier is black with a center and quilted sidewall Mossy Oak Break-Up Infinity Camo inlay. 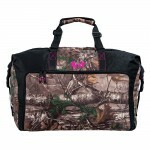 It features an pink lining, pink embroidery and accent stitching, pink mat bindings and accent pink zipper pulls. 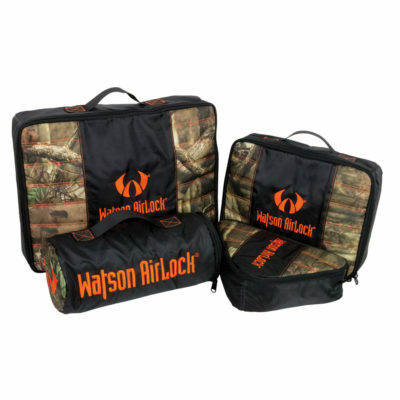 Matte black buckles, 100% nylon black webbings and a padded camouflage carry handle complete the look. 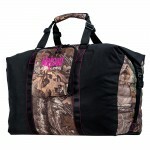 The Camo Carrier is made of premium nylon and polyester Barrier™ fabrics. All fabric components are treated on both sides (multiple times) with our exclusive Back2Back® 2 Sided fabric coating. 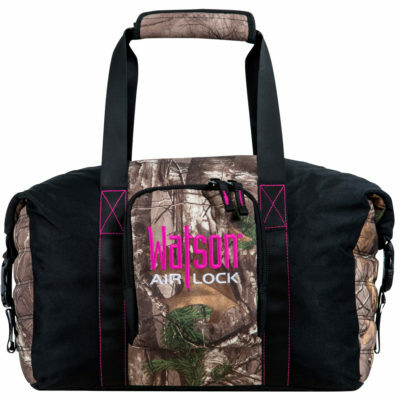 This will protect your clothing and gear from water, odors and abrasion. For added protection and to create a scent free storage area for your clothing, the pink contrast lining is Back2Back® coated and seam sealed. The Camo Series gear bags all include large, premium YKK zippers and buckles- the best of the best- so you won’t have to worry about a broken zipper interfering with your hunt. Premium outdoor threads are used at all sewing locations, and our gear bags are box stitched and reinforced with bar tacks for additional durability. To make the bags even more water resistant, we coated the back side of the embroidery locations. 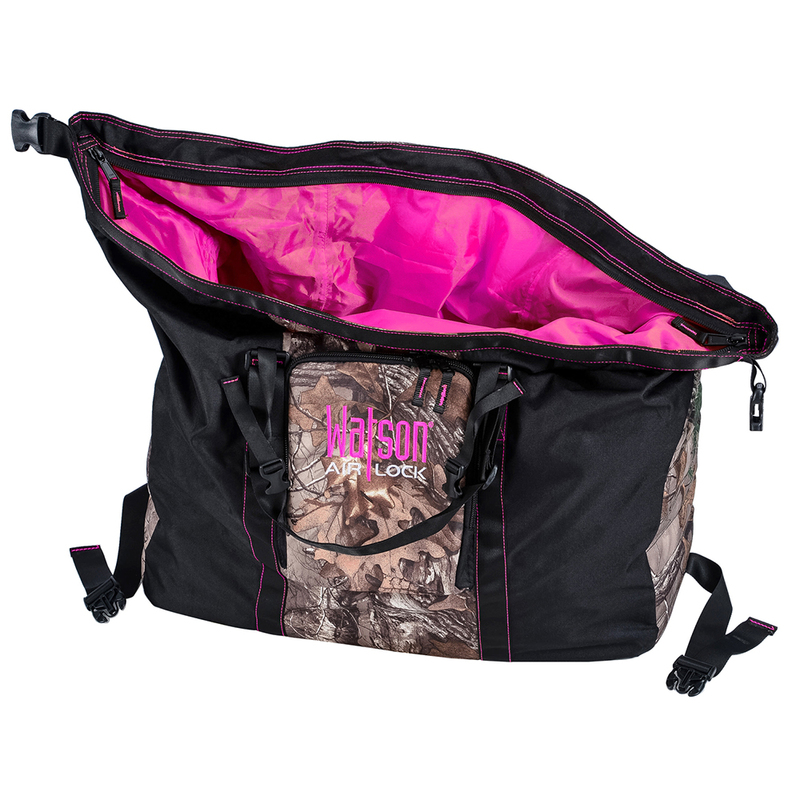 Launder your hunting clothes, hats, gloves and accessories in your favorite scent free detergent or carbon wash. Place the laundered garments into the pink liner section of the Mini Camo Carrier. Zip the two lining zippers to the center until they meet. Push the air out of the bag. Using the stiffener band at the top section of the bag, begin to roll the bag over onto itself and complete at least two full rotations. 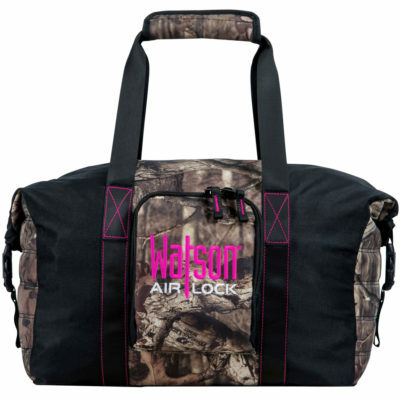 Secure the outside buckles to the buckles located on the sidewall. 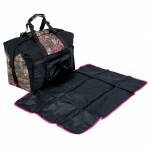 Your clothes will now remain protected and as dry and scent free as they were when you placed them into the bag. I absolutly love my Carrier!! I never have to worry about my hunting clothing getting wet or smelly. I just wash them in non-scent soap and throw them in the bag. 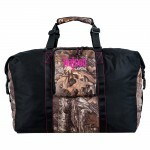 It is big enough to fit all my hunting clothing in but not to big to carry everywhere. With the fold out mat it makes slipping my camo on in the field very easy, never having to worry about getting my socks wet again!